Blue Valley visits St. Thomas Aquinas with likely a second-place finish in the Eastern Kansas League on the line. The Tigers and Saints are both off to 4-1 starts with their only losses coming to Bishop Miege. The Tigers fell 30-13 to Miege back in Week 3, while Aquinas lost to the Stags 37-20 a week later. Last week, Aquinas trailed Gardner-Edgerton early before scoring 21 points in the second quarter to win, 34-21. James Cosentino rushed for 148 yards and a touchdown and quarterback Karter Odermann added 104 yards and two scores on the ground for the Saints. Cosentinio leads Aquinas and is second in the EKL in rushing with 696 yards and six touchdowns. Odermann and Kyle Bollig have contributed 357 and 269 yards on the ground, respectively. Odermann has been effective when he’s looked to throw. He’s completed 21 of 40 passes for 395 yards and five touchdowns. The Saints can be effective on special teams as well as Cosentino leads the EKL in kick returns with an average of 30.7 per return. The Saint defense is led by Ben Ewing who registered 15.5 tackles including one tackle for loss last week. Aquinas is surrendering an average of 22 points per game. Blue Valley has rattled off consecutive wins since a Week 3 loss to Miege. Last week, the Tigers scored 21 points in the second quarter to pull away from winless Blue Valley North. William Evans led Blue Valley with 141 rushing yards on 25 carries. Evans, Colton McCumber and Hank Daily all rushed for touchdowns in the game. McCumber added 100 yards on the ground on 12 carries and passed for 45 yards and two scores. He hit Ryan Cyr and Alec Nichols on touchdown passes. On the season, Evans leads the Tigers with 447 rushing yards and four touchdowns. McCumber has been effective as a dual-threat out of the pistol. He has rushed for 356 yards and five scores and passed for 638 yards and seven touchdowns while completing 67 percent of his passes. Alec Nichols has been the Tiger’s main receiving threat with 16 catches for 242 yards and a pair of scores. The Blue Valley defense is an experienced group that has played well this season. Dylan Smith, Drew Heffernon, and Cody Sisson lead the Tigers in tackles with 57, 48, and 46, respectively. The secondary is led by Cyr, a Mississippi State baseball commit in, who has registered 17 tackles and two interceptions so far this season. Blue Valley won this matchup 35-3 a year ago and has won the last four regular-season matchups between the two schools. Aquinas last defeated the tigers 23-22 in the state quarterfinals of the 5A playoffs in 2012. While this matchup doesn’t quite come with the luster of last year’s showdown to open the season, Salina South and Derby are both off to impressive starts. The amount of build-up for this game may be less given the amount of talent each team graduated from a year ago, but that’s not to say the respective cupboards are empty. 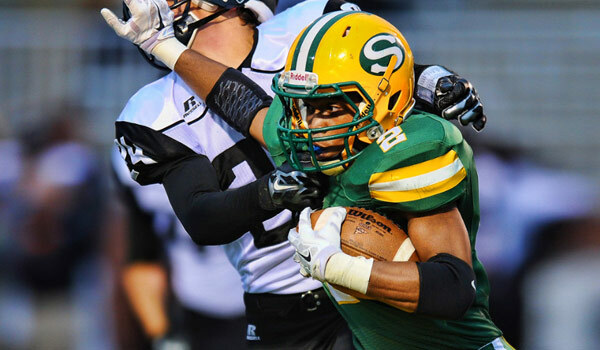 Salina South has started 5-0 and escalated its way up the 5A rankings to No. 2. The Cougars 27-21 win at Hutchinson in Week 3 was their only contest played within 29 points. Last week, Salina South score in each quarter in cruising past previously unbeaten Andover 42-10. Eric McCullough rushed for 143 yards to lead the Cougars, and Dalton Wassenberg passed for 140 yards and two touchdowns. Wassenberg also added 42 yards on the ground and a pair of touchdowns. The Cougars have had several players step up given all the experience that graduated off of last year’s team. Wassenberg, a 6-foot-6 quarterback, has directed the Cougar offense by passing for 979 yards and 14 touchdowns this season. When he looks to throw, it’s typically in the direction of Dylan Becker who has 21 receptions for 546 yards and eight scores. Jacob Marcotte is second in receiving with 18 catches for 288 yards and four scores. Sam Sellers’ teams are built on a solid ground game and this year is no different. After graduating the likes of Cody Busby and Mike Jones in consecutive years, the Cougars now feature McCullough and DeAngelo Turner. McCullough is averaging 6.5 yards per carry and has totaled a team-high 473 yards on the ground. Turner has rushed for 351 yards and five scores on his 64 carries. Wassenberg too can be a threat as he leads the team in rushing touchdowns with eight. After opening the season with a 20-13 loss at Maize, Derby has reeled off four straight wins including a 35-28 win over Hutchinson a week after the Cougars defeated the Salthawks. A week ago, Derby used a 31-point second half to turn a seven-point lead into a 45-14 rout over Newton. Quarterback Brady Rust completed 10 of 15 passes for 102 yards and a pair of touchdowns. He also rushed for a team-high 80 yards and a score. Friday’s game has a lot to live up to in comparison to last season. Remember the Cougars dominated the first half in building a two-touchdown advantage. Tyler West then tied the game with a pair of touchdowns in a matter of a minute in the fourth quarter to bring Derby back. That’s when South put together a 40-yard, game-winning drive after Derby failed to convert on a fourth-down. The Cougars scored with six seconds remaining on a 3-yard Mike Jones run to win 41-35. The Greater West Activities Conference title will be decided on Friday in Scott City when the host Beavers host the Ulysses Tigers. The Beavers can win the GWAC title outright with a win, while a Tiger win could force a three-way tie atop the standings. Scott City has won six of the last 10 meetings, including every year from 2008-12. Ulysses won 25-6 last season -- ending Scott City’s 17-game winning streak and 40-game regular season run. This has generally been a low-scoring game; the loser has never scored more than 13 points in the last 10 meetings. The winner has scored under 28 points six times in that stretch. Scott City has rolled to a 5-0 start by outscoring its five opponents by an average of 50 to 7. The Beavers dominated Holcomb 49-6 two weeks ago. Scott City has forced 15 turnovers and is plus-12 in turnover margin. Senior Trey O’Neil has completed 62 of 87 passes for 870 yards with 12 scores against zero interceptions. Junior running backs Wyatt Kropp and Cooper Griffith have led a balanced Scott City rushing attack with 541 and 450 yards, respectively. Ulysses junior Ian Rudzik could be Kansas’ best running back. He has rushed 73 times for 1,134 yards and 15 scores. Aside from him, Ulysses has rushed for just 628 yards and passed for just 42 yards. Rudzik also leads the team with 28 tackles. The Tigers, despite a big edge in total yards, lost 17-14 in overtime at Holcomb in Week 3. Ulysses has Rudzik, but Scott City has the better team. For the second consecutive week, Wichita Trinity will travel to take on an unbeaten Central Plains League opponent. This week, the Knights will take on powerful Conway Springs to likely decide the league title. Last Friday, Trinity went into then-unbeaten Cheney and forced five turnovers in beating the Cardinals, 38-7. Tyler Burns rushed for 160 yards and three touchdowns in the win, and quarterback Matt Jones threw for 178 yards and two scores and rushed for another. Jones was especially efficient in the win at Cheney and improved his season numbers to 569 passing yards and seven touchdowns. Burns, on the other hand, has now rushed for 872 yards and 18 scores. He’ll be a handful, even for a Conway Springs defense that has allowed only 14 points per game and no all of that has come against the varsity. In last week’s 56-21 win over Wichita Independent, Conway allowed only 93 rushing yards on 26 attempts. The Cardinal offense is as potent as usual. Conway Springs rushed for 380 yards in the win over Independent. Luke Fisher led the Cardinals with 229 yards rushing and four touchdowns on only 16 carries. He has now pushed his season total to 966 yards and 19 touchdowns on only 87 attempts. Travis Wood has added 465 rushing yards and four scores for the Cardinals. Wichita Trinity has never beaten Conway Springs, and last year’s 34-14 win by the Cardinals was the closest meeting in the series. Look for it to be a bit closer this year. This game is a rare Week 6 matchup between possibly Class 2-1A’s best teams. Sedgwick and Phillipsburg are each in Class 2-1A after successful runs in Class 3A. Both squads have taken a loss to an undefeated Class 3A team – Phillipsburg to rival Norton, and Sedgwick to surprising Hutchinson Trinity. Other than the Week 2 loss, the Panthers have won every game by at least 28 points. Sedgwick has collected four straight victories, also by at least 28 points. The styles are very different. Sedgwick loves to go to the air behind all-state quarterback Brylie Ware, while Phillipsburg has averaged 297 rushing yards per game. Panther senior Stuart Lennemann, arguably the state’s fastest small-school player, has 28 rushes for 347 yards and five scores. Senior Luke Jacobs has seven sacks and four tackles for loss. Ware has completed 61 of 115 passes for 779 yards with six scores against five interceptions. He also leads the team with 63 carries for 609 yards and nine scores. The difference will come if the Panthers can get put pressure on Ware – and if Sedgwick can haul in passes at critical times. Phillipsburg’s overall talent and physicality, though, will be too much. This is a rematch of a second-round playoff contest from last season – and the first of three straight weeks between Victoria, Beloit St. John’s-Tipton and Thunder Ridge that will reshape District 7 and Eight-Man, Division II. Last season, St. John’s-Tipton won the quarterfinal playoff game, 22-16, against a depleted Victoria team that missed several starters because of season-ending injury. Victoria took advantage of a blocked punt and several huge fourth-down stops to stay within one score, and had a chance to win or tie in the final minutes, but the drive fell short. This season, the Knights opened with a 42-24 road loss to Central Plains, while St. John’s-Tipton fell 42-22 to Osborne in Week 2. Senior quarterback Trey Dubbert leads an experienced group with 30 of 50 passing for 410 yards with a 7/2 TD/INT ratio. Junior Parker Gates has 20 catches for 285 yards and six rushing scores, and has seven receptions for 215 yards and three touchdowns. Victoria has spread the ball around and used a great turnover margin and defensive/special teams scores to win four straight. Junior Brady Dinkel, who started the final seven games last year after Sam Ottley had a season-ending knee injury, has completed 19 of 44 passes for 372 yards and five scores. He has rushed 33 times for 355 yards and five touchdowns. Bryan Dome has 38 offensive touches for 282 yards, but three long kickoff returns (38, 63, and 71 for a score). The touchdown is one of four defensive/special teams scores for Victoria this season. Victoria has also received great punting from junior Eric McAlonan, especially in a big Week 4 win at Ness City. The Knights, though, have struggled on two-point conversions throughout the fall, a point of emphasis for coach Doug Oberle. Like last year, I expect Victoria to make at least one big special teams play. Dubbert’s playmaking and the Blujays being at home will be a slight edge, but Victoria will make enough plays to win.